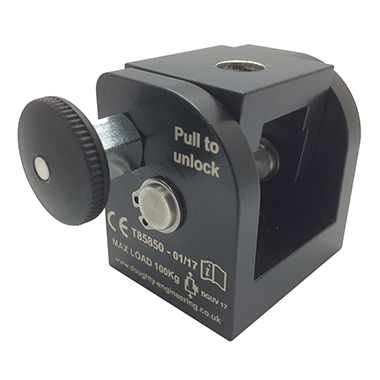 The Space Saver enables a clamp or Spigot to be permanently fitted to a luminaire or projector etc and folded into a storage position to save space. The clamp etc is not lost because it stays on the luminaire. The Space Saver features a quick release lock which enables the device to be folded quickly without tools. Manufactured from high tensile aluminium. The top section has a channel to hold captive an M10 hex nut or hex bolt while the bottom section is machined to accept an M10 socket cap bolt. This means the device can be rotated at any angle on the object to which it is fitted and secured.